The defender forecourt signs from Scribo Displays are available in two poster sizes and enhance the visibility of your business. 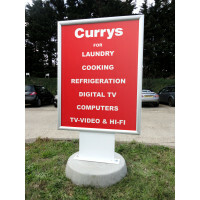 These forecourt signs are suitable for use in garages, car dealerships/showrooms or even petrol stations. They are available with anti-glare PET poster covers for protecting the display posters stored therein. The front-opening aluminum snapframes (38mm profile) stand on heavy concrete base Steel sub-frames with the panel area below frame also being suitable for permanent branding. The pavement category of these concrete-base streetboard signs also includes the Sentinel Forecourt Banner, Cyclone 2, and Sightmaster products. We will be happy to assist you with more information about our products and services. Browse through our catalogue on streetboard signs and select those that are most suitable for your display requirements.